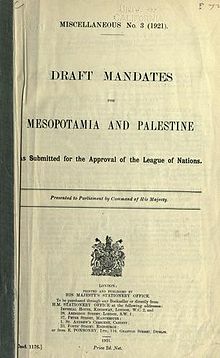 The proposed mandate faced certain difficulties to be established, as a nationwide Iraqi revolt broke out in 1920, after which it was decided the territory would become the Kingdom of Iraq, via the Anglo-Iraq Treaty. The Kingdom of Iraq became independent in 1931–1932, in accordance with the League of Nations stance, which stated such states would be facilitated into progressive development as fully independent states. The civil government of Anglo-administered Iraq was headed originally by the High Commissioner, Sir Percy Cox, and his deputy, Colonel Arnold Wilson. British reprisals after the murder of a British officer in Najaf failed to restore order. British administration had yet to be established in the mountains of north Iraq. The most striking problem facing the British was the growing anger of the nationalists, who felt betrayed at being accorded mandate status. Immediately after the end of World War I, Wilson, the future High Commissioner to Iraq, recommended the annexation of Mesopotamia to India "as a colony of India and the Indians, such as the government of India administer it and gradually cultivate its vast plains, and settle the warrior Punjab races in it." In a memorandum written on 22 April 1918, Cox listed the social groups that the British should support: the Jewish community in Baghdad, the notables in Baghdad and Basar, the rich landowning Arabs and Jews, and the Shaikhs of sedentary tribes. British Map appended to 1921 CAB24/120 cabinet memorandum showing proposed mandates. ^ a b c d The new Cambridge modern history. Volume xii. p.293. ^ Nadhmi, Wamidh Jamal Umar (1984). Al-Judhour al-Siyasiyya wal Fikriyya wal Ijtima'yya Lilharaka al-Qawmiyya al-'Arabiyya (al-Istiqlaliyya) fil 'Iraq (The Political, Intellectual and Social Roots of the Arab Nationalist (Independent) Movement in Iraq (in Arabic). Markaz Dirasat al-Wihda al-'Arabiyya, Beirut. p. 399. ^ Nadhmi 1984, p. 275.